Guaranteed repairs from ASE-Certified mechanics! Auto-Lab Waterford has quickly become Waterford Twp’s leading auto repair shop for maintenance, oil changes and automotive repair services. Located on Telegraph, just North of Voorheis, you have easy access to the best car repairs in the area. We offer monthly specials to save you money and are open six days a week to help save you time. 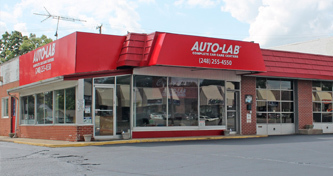 If you need a quick oil change or a mechanic you can count on, come to Auto-Lab Waterford. Our prices bring you in; our amazing service earns your trust. We have fleet and multi-car family discounts as well as limited lifetime warranties on many of our services. Every repair is backed by our nationwide 12-month/12,000-mile Auto-Lab warranty. This covers parts and labor for hassle-free repairs that keep you on the road all year long. Why come to Auto-Lab of Waterford? The contents of this webpage are Copyright © 2019 Auto-Lab Waterford. All Rights Reserved.